Who’s got $5.25 million to spend for a 30-second Super Bowl ad? We don’t, but brands like Anheuser-Busch, Doritos and Audi do. That’s the cost for a 30-second commercial during Super Bowl LIII. That’s roughly $175,000 per second. Last year, more than 103 million people tuned in. And this year, we can expect people to be watching on TV or streaming online. This is the one night people don’t fast forward through commercials. Here are some old favorites. In 2018, Tide created Super Bowl Commercials that aired in every quarter in an attempt to take over the Super Bowl. Their spokesman, Jim Hopper, told us to question every ad we see. If you see clean clothes, it could be a Tide Ad. Not only was their campaign funny, it worked because basically everyone uses Tide. Peter Dinklage and Morgan Freeman pulled off the best lip sync battle of 2018 in this Doritos and Mt. Dew commercial. Doritos featured their Blaze-flavored chips, while Mt. Dew featured their new lemon-lime flavored soda in a fire and ice themed 60-second ad. It worked because it got people talking on social media for days after. Snickers introduced the idea that you aren’t you when you’re hungry in 2010 with Betty White giving attitude after being tackled. This hilarious 30-second spot went viral creating buzz for the Mars candy and making a comeback for Betty White. What would Amazon do if Alexa lost her voice? Well, in 2018 they attempted their back-up plan and it didn’t go well. This 90-second spot featured Gordan Ramsay, Cardi B, Rebel Wilson and Anthony Hopkins, as Alexa. Amazon’s creative director said they chose real-life instances in where consumers like to use Alexa, like the kitchen. Then they chose celebrities based on different demographics. Another funny way to promote a brand that gets people talking. Last year, the NFL did a little self-promotion featuring the new rule change that touchdown celebrations would be allowed. It was a big deal for both players and fans alike. Here Eli Manning and Odell Beckham Jr. practiced what they would do. This 60-second spot was well received by their fans. This wasn’t the first time a commercial was released before the big game. But it was the most successful. The ad had more than 20 million views the week of the Super Bowl. Time later named it, The Ad That Changed Super Bowl Ads Forever. 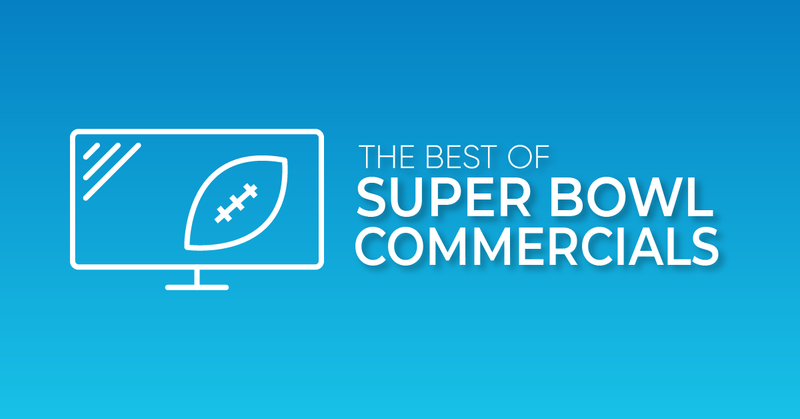 Originally airing during the 2011 Super Bowl, by 2015 it was still the most shared ad ever. It earned Volkswagen more than $600,000 in free media coverage. This ad aired first on Monday Night Football in 1979. It featured “Mean” Joe Greene, Pittsburgh Steelers Defensive Tackle and a 9-year-old fan. The boy offers him his Coke and in return “Mean” Joe Greene gives him his jersey. Greene said it transformed him from being unapproachable to approachable overnight. Debuting in 2008, Etrade’s baby spokesman showed how easy it is to trade stocks. It worked so well they featured the baby in every Super Bowl from 2008-2013. We could do an entire post on just the Budweiser commercials throughout the years. Both funny and emotional, Budweiser knows how to capture viewers attention. The most awarded campaigns in the history of advertising, spawning a ton of parodies and annoyed everyone who tried walking into a room full of people. It even surprised the creative group behind it for how big it got. Who doesn’t remember Bud-Wei-Ser? It not only won an award, but it also spawned multiple parodies, including the Simpsons. Only airing once, Budweiser created a 60-sec ad that paid tribute to the victims of 9/11 and the first responders. During the process they received approvals from members of Congress, the advertising industry and Rudy Giuliani, then Mayor of NYC. Not to mention the use of iconic Clydesdales. In 2006, Frito Lay pitched the idea that they would crowdsource the creative for their Super Bowl ad in a contest dubbed “Crash The Super Bowl.” Needless to say, agencies didn’t like the idea at the time, but over the last decade, the quality just kept improving to the point that the Doritos Ads are some of the most talked about Super Bowl ads every year. 21 of them have been aired during the last 10 years and most didn’t disappoint. In 2016, Doritos decided to use user-generated content 365 days a year instead of only focusing on one day. The most talked about ad in 2013 was the 2-minute ad featuring the voice of Paul Harvey and his 1978 speech and a slideshow of still images depicting farmers as strong, hard-working and family-oriented. It was successful in telling a story and not featuring the brand. Larry Bird and Michael Jordan star in The Showdown where they play each other for a McDonald’s Big Mac and Fries. The two 30-second spots show them hitting basket after basket in increasingly difficult shots and boosted the catchphrase, “Nothing But Net.” McDonald’s followed it up in the next big game and then redid it later using Lebron James and Dwight Howard. This year you can expect major brands trying to be funny or to pull at our heartstrings. Like years before, many ads have been released already with the hopes of getting people to talk about their brand. Microsoft is releasing an adaptive controller for their Xbox. You can follow the inspiring stories of these young gamers in Microsoft’s commercial. Find out what didn’t make the cut in this hilarious new 90-sec spot from Amazon. The worst elevator in history. Can’t afford Super Bowl Advertising? Most people can’t. But, all isn’t lost. We can help you reach targeted audiences that are engaged and looking for your products or services through digital advertising like pay-per-click, search engine optimization, paid social and improved web performance. Talk to us to see what kind of engagement you can get.